Backsplashes can be simple and practical, or lavish and distinctive. Whether you choose porcelain, glass, stone or ceramic tiles for your new backsplash, FLOFORM can help you create a look to best suit your style. Feel free to Contact Us anytime! When it comes to counters and backsplashes, the classic and durable will always get you the best return on investment. 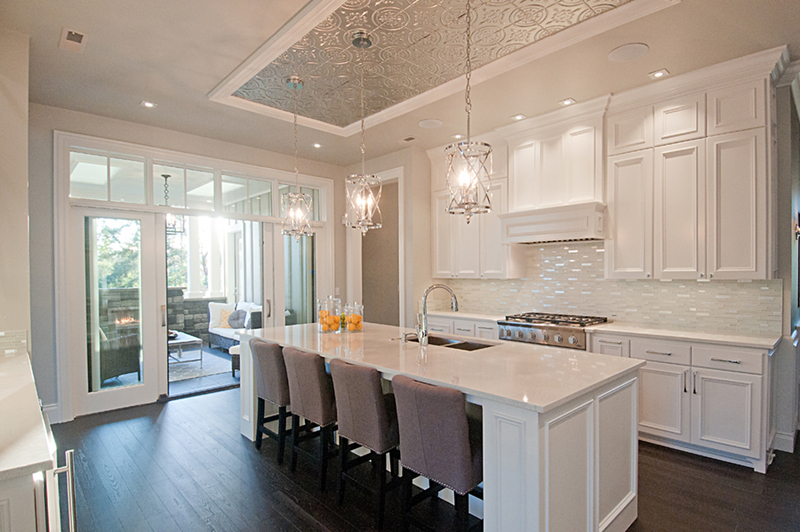 Backsplashes can be really cool! You’re cooking a big meal, you’re getting ready to host a party, you don’t want to be staring at a boring backsplash all day. This is an area that can add a lot of pizzazz to your kitchen, so long as you’re ready and willing to coordinate it with the rest of the space. 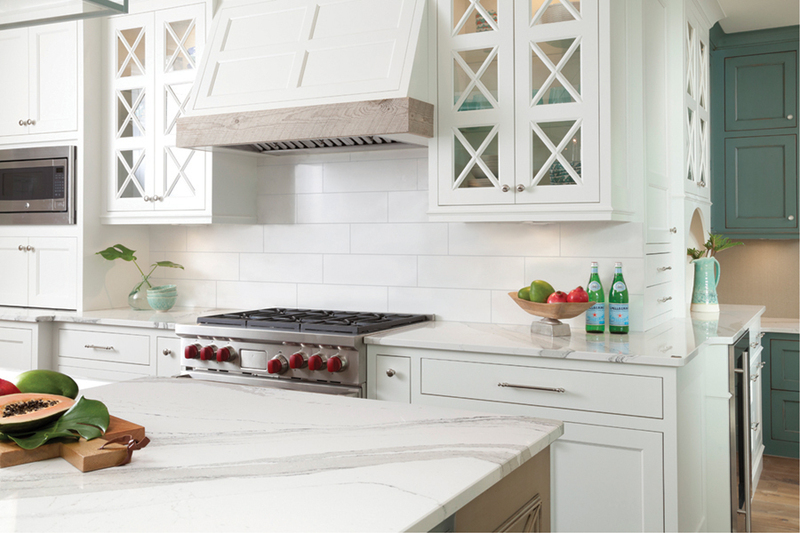 Without further ado, here are some tips on choosing a kitchen backsplash. 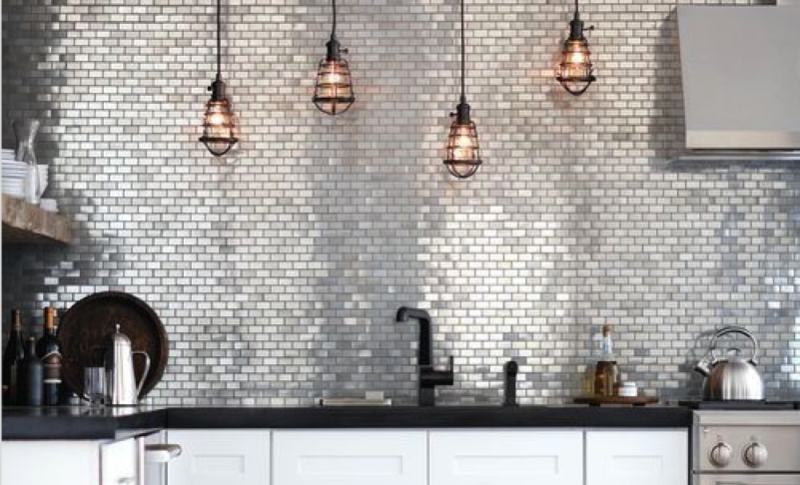 Having a cool backsplash is a lot of fun, but it shouldn’t break your budget. 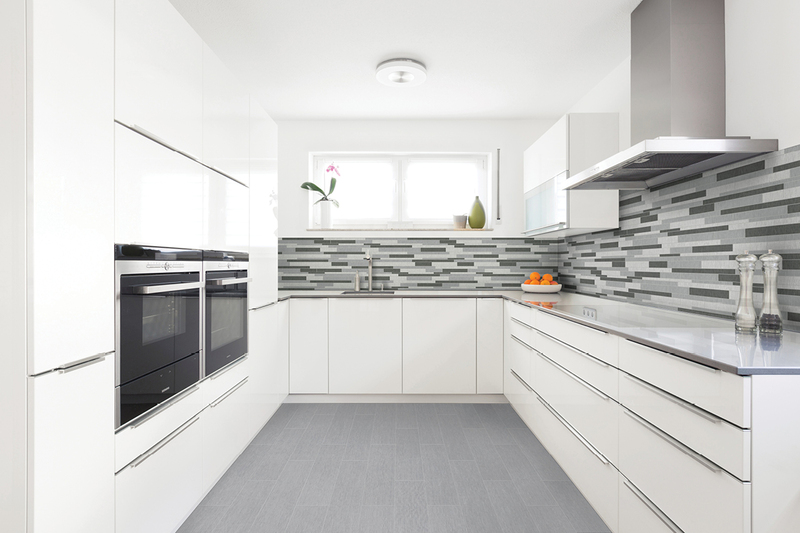 Inexpensive, white ceramic tile backsplashes are available for a very low cost, so be sure to focus on the more essential components of your kitchen first. Appliances, countertops, and fixtures should take precedence over stylish backsplashes when planning your kitchen. Remember that the backsplash is there to catch splashes, and if you’re as enthusiastic a cook as I am, you may be cleaning it often. Porous materials can look stunning for a backsplash, but they do need to be cleaned more carefully and more often, so opt for ceramic tiles if you want an easier time of it. There are plenty of environmentally friendly options for your backsplash as well; bamboo, cork and recycled glass can all be used to wonderful effect in a backsplash. You can also go for a more traditional look and use recycled tile. Lighting and countertops will dictate the patterns and colors of your backsplash; you have to keep these in mind in order to have a cohesive kitchen design. A good way of testing a mix of colors and patterns is by affixing color and tile samples to where the new backsplash will go. Watch how the samples look in different daylight and try varying degrees of artificial light if you have light dimmers. It’s a good idea to pick the main color and a few accent colors for your kitchen. A great way to incorporate the pattern of your countertop into your backsplash is by using stainless steel, brass or bronze tiles and adding tiles in the style of your countertop as accent points. You don’t necessarily want a monolithic slab of quartz as your backsplash, but mixing with metallic tiles after testing the pattern using the above method is a great way to have a cohesive color theme. Backsplashes are one of the most easily replaceable elements of your kitchen; don’t go out of your way to replace it every three months, but it’s okay to go a bit wild here because it’s easy to change if you’re not feeling it. Always remember to make sure your backsplash coordinates well with your countertops, which are the most visually striking element of a kitchen due to their large surface area. Quartz countertops are made in a wide variety of striking patterns, so they go well with a plethora of different backsplashes. FloForm has beautiful colors that will work wonderfully for any kitchen design. 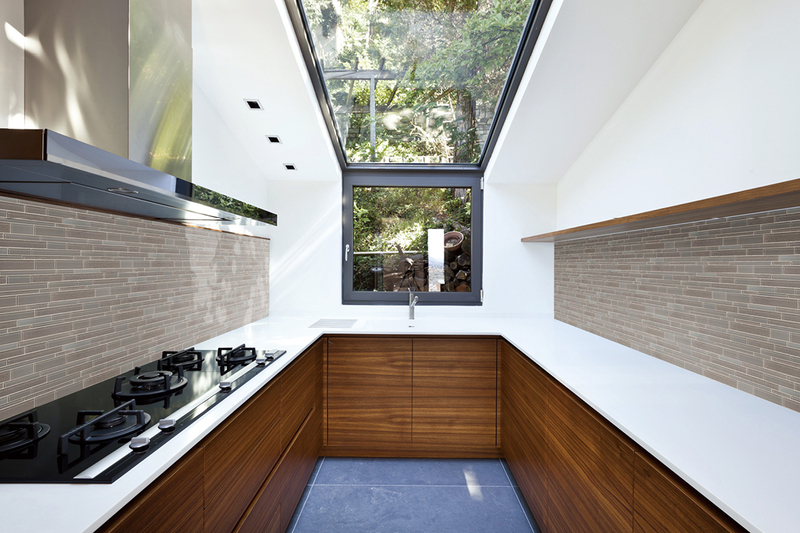 The warm neutral colors of the glass tiles, help tie in the wood in this bright and modern kitchen. Featured tiles: Ames Tile. Cool greys and white tile complement this clean and minimalist kitchen. Featured tiles: Ames Tile. Hints of sparkle within the backsplash help bring all the details of this kitchen together for a cohesive look. Featured tiles: Emser Tile. These large white quartz tiles are the perfect way to allow the focus be on the countertop, and truly let the design shine. At FLOFORM our design consultants will help you plan your whole look, so the backsplash works with your flooring, cabinets and countertop. We work with high-quality tile companies to provide a range of colors, styles and textures for your kitchen. Book a complimentary in-home consultation today, and we’ll bring our selections to you!